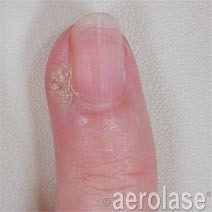 Warts have traditionally been removed with modalities such as surgical excision, freezing or chemicals. But with the advent of laser technology, now they can be removed by simply destroying the root vasculature with the laser, thus avoiding collateral tissue damage or scarring as well as minimizing treatment discomfort and eliminating the long healing time from surgical incisions. What type of laser do you use to treat warts? At Maine Laser Clinic we employ the LightPod Neo for its MicroPulse-1064™ technology, delivering exceptionally high power for very deep penetration of the laser energy. The laser selectively targets hemoglobin and, in doing so, destroys the vasculature that feeds a wart lesion. 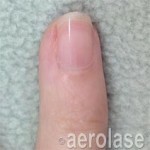 As a result, the blood supply is removed and the wart eventually dies off. This modality is less painful than traditional wart removal methods, and the laser treatment avoids the damage or destruction of adjacent skin tissue – which can be significant in particular when surgical excision is used on plantar warts of the feet and other larger warts. Also, our laser is uniquely gentle with its 0.65msec pulse duration, which makes it much more tolerable for treatment of genital warts, plantar warts or any other sensitive areas as compared with traditional long pulse Nd:YAG lasers. To learn more about non-invasive wart treatment contact us today for a FREE consultation!